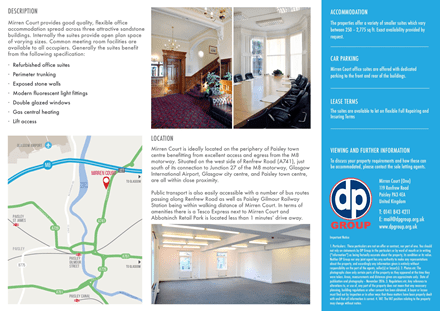 Great Offices To Let in Paisley! 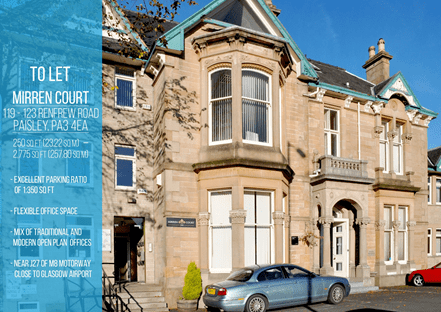 Visit Mirren Court on Renfrew Road or call 0141 843 4211 to arrange a viewing! The office is 275 sqft and the all-inclusive rent is £330 pcm + VAT. The office is ideally located near M8 Jct and Glasgow International Airport and benefits from lots of facilities nearby such as: on-site parking, on-site management, excellent access to public transport, lots of amenities nearby. Call 0141 843 4211 to arrange a viewing. Our fresh refurbished office at Mirren Court One. https://i1.wp.com/www.paisley.org.uk/wp-content/uploads/2018/03/ednllhdlnkmmogfe.png?fit=441%2C312&ssl=1 312 441 Brian McGuire https://www.paisley.org.uk/wp-content/uploads/2015/09/paisley-logo-trans.png Brian McGuire2018-03-29 16:20:242018-03-29 16:21:56Great Offices To Let in Paisley!